The massive success of Percy Sledge's #1 hit "When A Man Loves A Woman" in 1966 had thrown Quin Ivy's little Norala studio into the big league. Sledge's records were distributed by the Atlantic label, and after two successful follow-up hits later the same year, Atlantic was eager for more. Ivy took every chance he could to record Sledge at Norala when his busy touring schedule allowed. In early 1967 two singles recorded the previous December were released. The first, Bobby Womack's "Baby Help Me", only made it to #44 on the R&B chart. The second, the superb country-soul ballad "Out Of Left Field", by Dan Penn and Spooner Oldham, fared better and made it to #25. 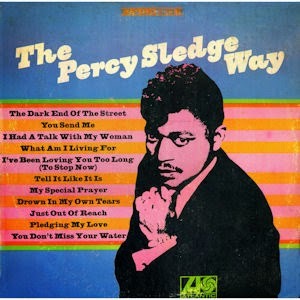 However neither songs would be featured on a Percy Sledge album until 1968. The fact that the ballad was more successful than the upbeat number was indicative of where Sledge's strengths lied. His third album was recorded and released later in 1967, and focused on Sledge's talents with ballads. It was made up entirely of cover songs, including "The Dark End Of The Street", "I've Been Loving You Too Long", "Tell It Like It Is", "You Send Me" and "Drown In My Own Tears". All well-known R&B ballads, done The Percy Sledge Way. An album of cover songs was perhaps not the best idea commercially speaking (surely if it had featured "Out Of Left Field" it would have been more successful), but nevertheless it made for an excellent record. Your gift was from God, and to his bosom you are now returned.